According to the National Bureau of Economic Research (the official arbiter of U.S. recessions) the US recession began in December 2007 and ended in June 2009, and thus extended over 18 months. During the Great Recession Americans saw some 40% of their wealth wiped out. The Federal Reserve conducted a study in 2012 that showed the median net worth of families plunged by 39 percent in just three years, from $126,400 in 2007 to $77,300 in 2010. That put Americans roughly on par with where they were in 1992, meaning some two decades of wealth accumulation was erased in just 18 months. The recession was especially hard on African-Americans. According to a study by Jeanette Wicks LIM, the typical black household in 2009 was left with less wealth than at any time since 1984, after correcting for inflation. And that lost wealth is not being re-accumulated, or being re-accumulated at an agonizingly slow pace. The U.S. Census Bureau reported in September 2014 that U.S. real (inflation adjusted) median household income was $51,939 in 2013 versus $51,759 in 2012, statistically unchanged. In 2013, real median household income was 8% lower than in 2007, the year before the Great Recession. Thus, six years after the Great Recession officially ended, for many Americans the devastation of their quality of life continues as they are unable to find work, their unemployment insurance long ago ran out and they join the ranks of government dependents or members of the shadow economy. According to the front pages of the major newspapers and the lead segment on the TV news unemployment is down to 5% -- or what was considered to be near full employment before 2007. Indeed in November, the number of “unemployed persons” was only 7.9 million, and was essentially unchanged from the month before. And most importantly, over the past 12 months, the unemployment rate and the number of unemployed persons are down by 0.8 percentage point and 1.1 million, respectively. So people were finding work and the unemployment rate is going down, right? The unemployment rate is going down because workers are leaving the workforce, not because they are finding jobs. And for the over 93 million workers who have left the workforce the Great Recession is by no means over as their quality of life and wealth continue to erode. As our friend Ben Weingarten explained in “Everything You Thought You Knew About the Unemployment Rate Is Wrong” for genfkd.com there are more than one “unemployment rates” collected by the government, and while the one that hits the front pages (the U-3 rate) says unemployment is 5%, the one that Obama-friendly reporters ignore (the U-6 rate) stands at 9.9% or almost twice the more commonly reported rate. Lost in these numbers says Weingarten is the fact that millions of people that you might otherwise think are unemployed are not counted in the unemployment equation of Unemployed ÷ (Employed + Unemployed). Persons not in the labor force who want and are available for work, and who have looked for a job sometime in the prior 12 months (or since the end of their last job if they held one within the past 12 months), but were not counted as unemployed because they had not searched for work in the 4 weeks preceding the survey. In other words explained Weingarten, if you haven’t identified yourself as searching for work in the four weeks prior to the government survey, you do not count as a person in the unemployment rate equation, which artificially decreases the unemployment rate. This also means that the unemployment rate does not reflect those who have dropped out of the workforce altogether, including those who might have otherwise sought work were economic conditions stronger. Meanwhile, says Weingarten, based on the definition above, to be “employed” by BLS standards means passing a very low bar that could include you getting paid to work one hour per week, meaning that the denominator is inflated and thereby further artificially decreasing the unemployment rate. 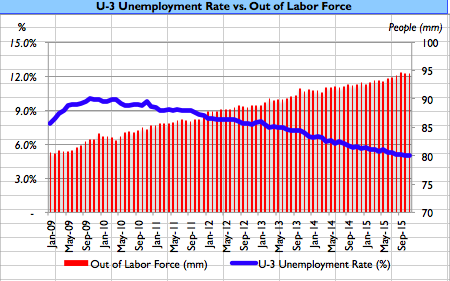 As the unemployment rate has fallen from its peak of the last economic cycle during the depths of the recession in 2009, the number of people defined by the BLS as “not in the labor force” (i.e. excluded from the data) has exploded Weingarten points out. By sheer arithmetic concludes Ben Weingarten, the data would seem to indicate that the unemployment rate paints a rosier picture than the actual economic climate. But what’s even worse for the long term economic outlook is that, according to the Congressional Budget Office, only one-third of the current non-participants in the labor force are likely to return. Fewer workers might mean rising wages for some, but it also means a smaller overall economy, fewer workers means that the wealth erased in the Great Recession will be re-accumulated at a much slower rate (one wage-earner in a family instead of two) and fewer workers means fewer taxpayers paying taxes to fund the government benefits such as food stamps, welfare, Social Security and other means by which many of the non-participants in the labor force survive. What’s more the CBO sees these negative factors impacting the economy for another decade. So, if you don’t see the “Obama Recovery” and remain puzzled by the failure of Obamanomics to help those middle class families it was allegedly going to put back to work, fear not. The devastating effects of Obama’s policies on African-Americans, younger workers, the low-skilled and those nearing retirement age can be explained in one chart – Ben Weingarten’s unemployment vs workers out of the workforce chart.